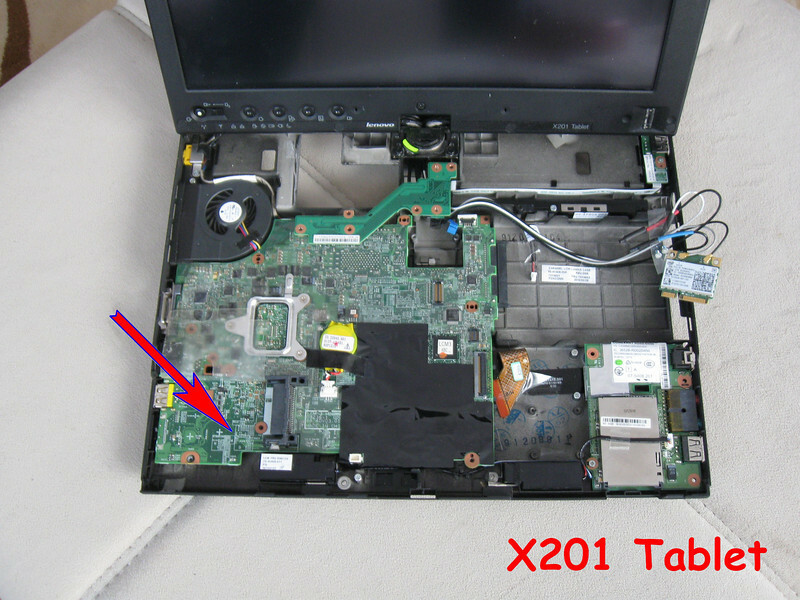 Switch the X201 Tablet OFF. The links above are to the Lenovo site, if it doesn't work, don't panic, it isn't broken, their site is shut down daily for maintenance and at those times they display spurious messages like the page you requested cannot be found, wait a good while and try again. Once you have your HMM search the manual for "Removing and replacing a FRU" then scroll down to Keyboard, follow the instructions in the manual to remove the keyboard to gain access to the connection points. 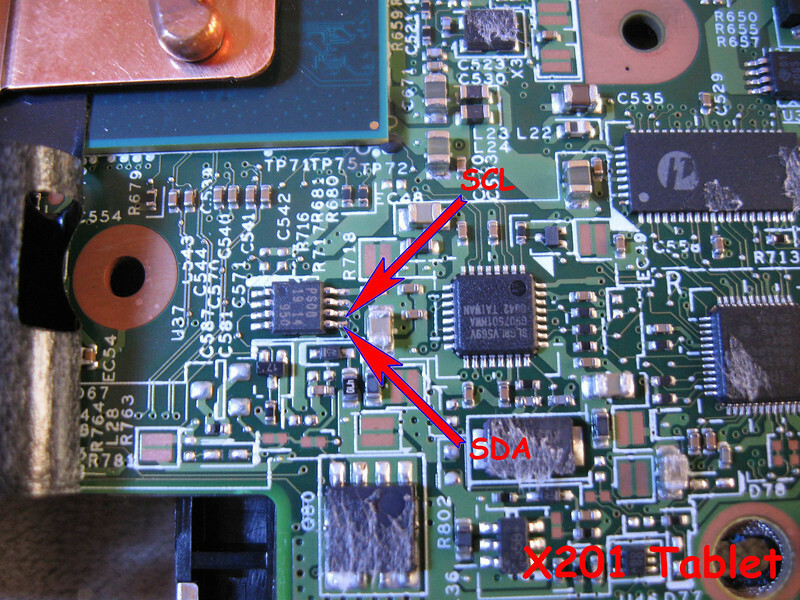 SDA and SCL connection points are shown in the photo below, these connection points are a convenient access to the EEPROM connections which save having to dismantle the X201to gain access to the underside of the X201 Tablet System Board. I receive many emails asking about the GND connection, in reality it is very simple, you use some kind of a clip so that you don't have to hold it in place, you DON'T HAVE 3 HANDS and there are 3 connections, GND SDA and SCL, so have a clip for GND, then you can use the 2 hands YOU DO HAVE to hold your SDA and SCL probes in place. 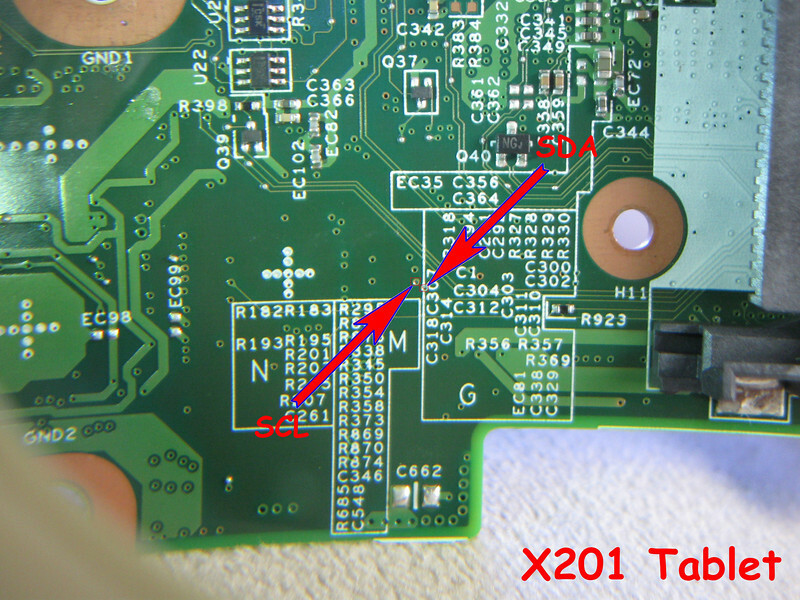 Almost any large piece of metal or the screws for the external connectors of any ThinkPad are a good GND connecting point. Basically you make the System board functional outside of it's case which includes mounting heat sink and fan on CPU. Once you have taken care of the GND connection. You push the sharp probes onto SCL SDA , this is the reason you need 2 persons, not enough hands to hold the probes and run the software. This is not easy, you will need to have the Keyboard [and optionally the LCD] plugged into the system board in such a way that none touch any contacts on the system board, use paper as an insulator to keep things from electrically shorting out, later you will need to plug in the AC adaptor and switch ON the TP, then you will need to hold 2 probes in place to the SCL and SDA points on the system board. See my page on Options for Clips and Probes including making your own probes. This page ONLY describes how to connect the KeyMaker Interface to the EEPROM. Assembling your TP - AFTER - you have finished. Follow the Hardware Maintenance Manual [FRU System Board], very carefully, double check screw type and size for each individual module. Assemble the TP in the reverse order used to dismantle it. I make no warranty that any of my information is correct, or safe, or does or does not breach any warranty clause, or anything else, it is up to you to decide if you will follow all or any of the instructions to recover the Supervisor Password from a TP. It is up to you to decide, I am not responsible for the results or for any consequential or incidental damages whatsoever.